The Getty has an incredible collection of Leonardo da Vinci’s notes and sketches on exhibit through June 20th. They are absolutely fascinating…I’ve never seen anything like them. No longer must we guess about what went through the mind of Leonardo. 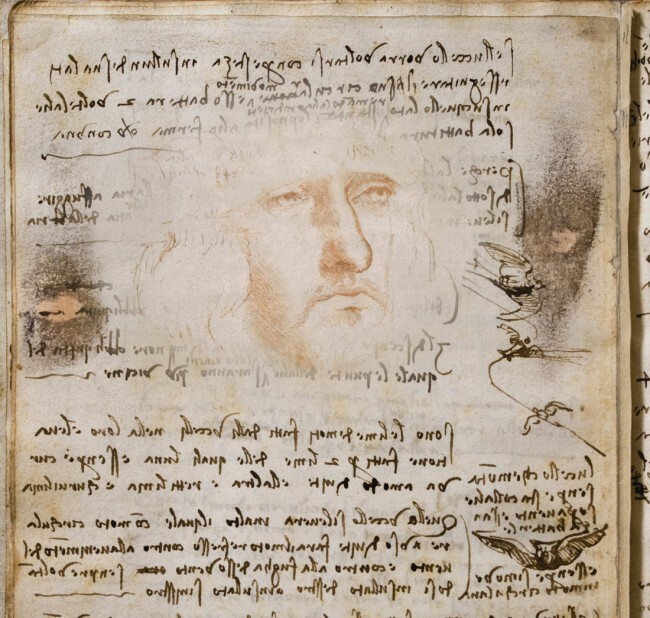 Pages and pages of his revolutionary thoughts are on display, showing his studies of anatomy, sketches of robots and machines, diagrams, face studies, and notes. They are such intimate things to look at, especially considering the great care he took to guard his notes; he knew his thoughts were coveted and his knowledge treasured. 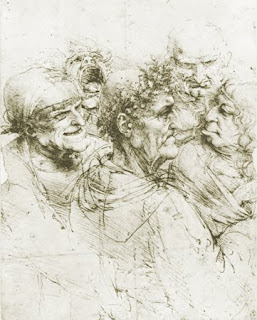 On some of the pages you can see how he concealed some of his ideas with ink smudges. 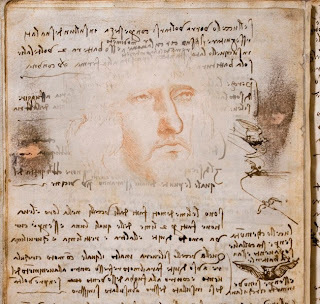 Leonardo’s handwriting is gorgeous. His Italian looked swiftly yet meticulously scratched down, and was written from left to right (he was left-handed). It’s beautiful to look at (I would love it as wallpaper) and I think only rivals the beauty of Jane Austen’s script. Just for fun, you can use a handwriting generator to copy his handwriting here. 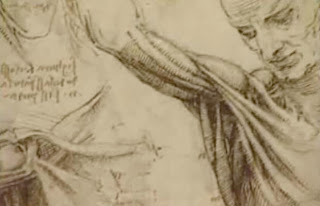 Leonardo wrote that “Learning never exhausts the mind.” He must have not been in seminary. (Joke!) Seriously, I love how curious he was and how he relished learning about the world. I love that he used his knowledge to create beautiful things. I would have loved to have known him; the most interesting people I know are the ones who are interested...in things, in people, in life. Thanks to my dear friends at the O.C. Gazette, I was able to see an amazing production of the Pulitzer Prize-winning play Crimes of the Heart last Saturday night. I was so excited about seeing this play that I even bought it and read it before seeing South Coast Repertory's incredible production, which runs through June 6th. Go see it! I love plays, and this is one of my new favorites! Hide in the heart of God. I once wrote down every name that God is called throughout the book of Psalms—my refuge, my rock, my shield, my fortress, my stronghold, my deliverer…Those names mean protection, strength, and safety. And God is the ultimate provider of those things. We can rest in His presence—hide in Him—when we feel anxious, overwhelmed, hurt, helpless, hopeless, or defeated. God is our shield and our strength. For many of us, fear, anxiety, guilt, and shame keep us from seeking refuge in God, because we feel unworthy, unlovable, or ashamed to approach Him. So we “hide” in other things instead. I know that I have a tendency to hide in my circumstances and make excuses for not having enough time for God, to hide in worry and let it dissolve my trust in Him, and to hide in anxiety and let it rob me of the rest and reassurance that God wants to cover me with. What do you hide in? Relationships? Schedules? School and work? Financial stuff? The list never stops, really. But we need to learn to hide in the heart of the God who created us, chose us, loves us, and protects us, instead of letting our view of reality be manipulated by our often fickle emotions or distorted sense of identity. Author Brennan Manning wrote that the heart of God is Jesus’ hiding place, a strong protective space where God is near, where connection is renewed, where trust, love, and self-awareness never die, but are rekindled. In times of opposition, rejection, hatred, frustration, busyness, or danger, Jesus retreats to that hiding place where he is loved. In times of weakness and fear, a gentle strength and mighty perseverance are born there. In the face of mounting incomprehension and mistrust, the Father alone understands him. That’s the place where I want to hide. What does hiding in the heart of God look like? It's as simple as taking five or ten minutes to pray, a word of surrender or repentance, a commitment to trust, to read a verse or two, or to quote a song that expresses God’s love for you. It's taking a moment to shift your perspective. No, this isn’t about Justin Bieber. I’m talking about Colton Harris-Moore, a 19-year-old kid from Washington who has broken into nearly 100 homes throughout the Pacific Northwest…and is giving the FBI quite a headache. 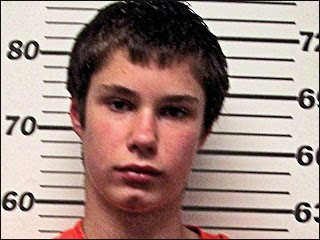 Think Frank Abagnale Jr.--the young crook who inspired the film “Catch Me if You Can”--but in 2010. I first heard about this kid because he’s actually targeting my neighbors’ daughter and son-in-law! They live on Orcas Island in Washington, and Colton has broken into their house and stolen their food, cars, and even one of their planes. Sometimes he’ll break into a house just to eat some dessert or take a bubble bath. He’ll write taunting notes to the police and has also broken into a deputy’s car and stolen a rifle. T-shirts, a 20,000-fan facebook page, and now a four-page article in Maxim are turning this delinquent into a hero; his “fans” affectionately call him the “Barefoot Burglar,” because he once kicked off his shoes as he was being chased into the woods. Frank Abagnale had a lucrative career with the FBI after he was caught and served about a four year sentence in American prison, but I’m not sure that Colton will meet the same benign fate. I guess we’ll see when…or if…he gets caught. 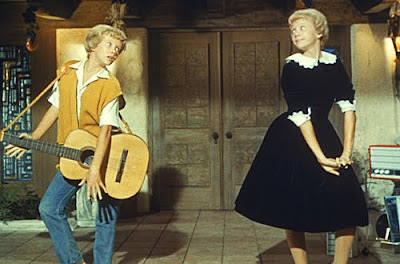 One of my favorite lines in the movie was during the dance at their summer camp, when one of the girls complained about the camp's restrictions on make-up to a boy. 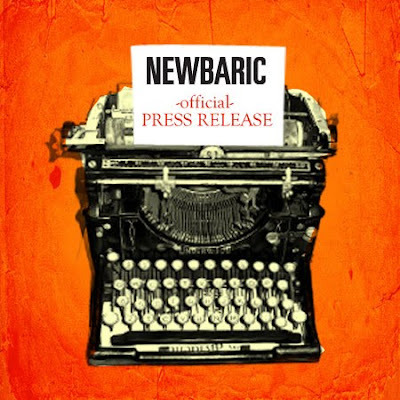 She said, “I feel absolutely naked without my lipstick.” Oh, she was so devastatingly blase...I just thought that was the coolest line ever, and I wished so much that I wore lipstick and felt incomplete without it. Check out May's issue of the OC Gazette for my article featuring OC artist Brian Lindstrom of Newbaric Designs. AND...check out his website because he posts a new design daily, and they're amazing! The above design was to announce the article. So cool, right?! Alright…the post about New York. You’ve waited patiently. And it’s here. Okay, so I did take one picture on the subway...when I ran into the Travel Channel's Samantha Brown! 2. The people. I really enjoyed not only watching, but interacting, with the people of New York. The man who owned the corner café that my friend and I walked by each day always waved to us from inside. A frail old woman with a walker, named Bea (short for Beatrice), asked us to help her cross the street so she could get a slice of pizza (girlfriend was hungry!). One evening, we consoled our waiter, a disgruntled youth trying to make it big on Broadway, who had just gotten a rejection call that day. I even met a girl in Soho who went to UCI (Zot! Zot!) and majored in art history. 3. The hotels, steeped in elegance, history, and sometimes even tragedy. I crashed on Jeananne’s couch in her adorable apartment on the Lower East Side for the duration of my visit, so I did not actually stay in a hotel. But I did ask that we make a few special visits to some famous ones. First was The Plaza, arguably the most famous hotel in the city. It really was so magnificent that I marveled that it was even “for real.” We also visited the Waldorf=Astoria, which hosts the piano of jazz legend Cole Porter in the lobby, and sipped “Mad Tea Party”-flavored tea and nibbled on scones at the St. Regis. The King Cole Bar at the St. Regis, named after the beautiful Maxfield Parrish mural along the back wall, invented the Bloody Mary. We also had fun visiting the Library Hotel, a little boutique hotel with a lobby full of books and rooms themed after categories of the Dewey Decimal System. The Beatles stayed at the Plaza during their first trip to the United States in 1964. Tea party at the St. Regis. Porter performed exclusively on Steinway pianos. I would love to stay here someday! 4. The foreign familiarity. So many films and TV shows are filmed or take place in New York that you feel a certain sense of familiarity with it, and since 9/11 I think we almost feel a sense of ownership of it as Americans, too. It’s one of the most recognizable cities in the world…“the only real city-city,” as Truman Capote put it. Most people are familiar with the Statue of Liberty, Brooklyn Bridge, and Empire State Building, but it seemed that even things like little nondescript cafes or apartment stoops seemed recognizable, too. A city chock-full of cultural, architectural, and historical icons has become an icon itself. 5. The food. 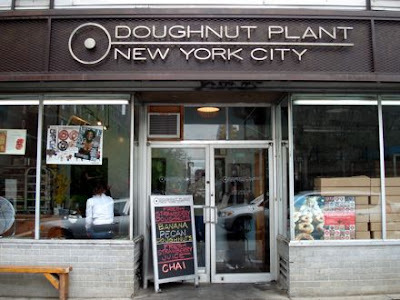 We had some delicious meals in New York, but I need to just focus on the Doughnut Plant for a minute. This place is a tiny little donut shop on the Lower East Side, literally one minute from Jeananne’s apartment. Each little delectable donut cost $2.50-$3, and we each ate two…every morning…for a week. Now, before you judge me, let me just explain—these donuts are incredible…incredible. It’s all in the details—they’re completely glazed, not just glazed on top; the filled donuts are square, so every bite includes the filling; and the flavors aren’t typical, either—crème brulee, banana pecan (my favorite), coconut crème, pistachio, pomegranate. Mmm…I’m craving one right now! These babies are worth going out of your way for! 6. The art. So many first-rate museums call New York their home, and I saw such an incredible variety and massive amount of art in just a short amount of time—art that made my heart ache with its beauty, art that made me think, art that was ugly and intriguing, art that I couldn’t turn away from, art that forced me to use every ounce of my self-control not to touch. The Met and MoMA are usual stops, but the Cloisters are probably a less obvious destination for travelers. At the northern tip of Manhattan, this branch of the Met is dedicated to the art of medieval Europe. The structure itself is built to resemble a monastery and has actual architectural pieces from medieval French monasteries incorporated into it. You feel like you’ve been transported back in time instead of hanging out in modern-day Manhattan, and it’s a unique and beautiful experience. One: Number 31, 1950 by Jackson Pollock. Water Lilies by Claude Monet. Les Demoiselles d'Avignon by Pablo Picasso. Campbell's Soup Cans by Andy Warhol. The famous unicorn tapestry inside. 7. Being a little kid in a big city. In Central Park, Jeananne and I rode the beautifully hand-carved carousel (a very satisfying way to spend $2) and then bought ice cream and skipped along the Mall. Late at night after a show, we shared iPod buds and danced down the street to Ke$ha and the Black Eyed Peas. At the Plaza, we asked a man at the reception where Eloise was. In Greenwich Village, we at ate Peanut Butter & Co., a restaurant devoted to the fine cuisine normally confined to the lunch tables of elementary schools—peanut butter sandwiches and carrot sticks. At F.A.O. Schwarz, we danced on the giant piano just like Tom Hanks did in Big. Even the more ‘cultured’ trips we took to museums or hotels couldn’t disguise the giddiness of two little girls playing dress-up at Tiffany’s and sipping afternoon tea. Being young at heart…it’s a beautiful thing. Lunch was "The Elvis," a peanut butter, honey, and banana sandwich. 8. The buildings and architecture of the city. From the rooftop of Jeananne’s apartment on Easter night, we sat and watched the sun set over the famous skyscrapers, apartment buildings, and water towers as darkness slowly blanketed the city. We saw the city lights slowly spring up, engulfing us in sparkle. And it is a city that sparkles with its juxtaposition of old and new architecture. One of my favorite buildings was St. Patrick’s Cathedral on Fifth Avenue…a gothic-style cathedral in a modern city commanding respect and awe even among its taller and more modern neighbors. Rooftop view of the Lower East Side. View of the Empire State Building from Bryant Park. 9. Broadway shows. It was difficult to choose which musicals to see, but we were happy with our two choices: “American Idiot” at the St. James Theater, with a young and talented cast (including Spring Awakening’s John Gallagher Jr.) and music, obviously, by Green Day. Second was “Promises, Promises,” at the Broadway Theater, starring Will & Grace’s Sean Hayes and one of my favorite performers, Kristin Chenoweth. The story was based on the film The Apartment, starring Jack Lemmon and Shirley MacClain. After each show, we went out for dessert, one night at Café Lalo, and another night at Sardi’s—both great places to top off our fun nights out! There are currently 1,300 celebrity caricatures on display in Sardi's. 10. The literary pilgrimages. New York City is a book lover’s paradise: The New York Public Library has Christopher Robin Milne’s beat-up stuffed bear from Harrod’s that inspired Winnie the Pooh, not to mention a killer gift shop. Down the street is Library Way, a small section of sidewalk along 41st Street between Fifth and Park Ave, dotted with plaques of quotes and poetry. McSorley’s was a must to visit, not only since it didn’t admit women until a court ruling in 1970(!!! ), but also because Pulitzer Prize-winner Frank McCourt was a frequent downer of pints in the sawdust-floored Irish pub. We also saw the White Horse Tavern in Greenwich Village, where poet Dylan Thomas downed eighteen shots of whiskey one night in 1953 and later collapsed and died at Hotel Chelsea; Kerouac also used to hang out there. And bibliophiles cannot miss a trip to The Strand bookstore, with its “18 Miles of Books,” including first-editions and signed copies. In front of the NY Public Library there are two lions, named Patience and Fortitude. The famous Rose Reading Room at the Library. The bronze lamps are over a hundred years old. A.A. Milne gave Christopher Robin this bear for his first birthday. A plaque on the street of Library Way. Poet ee cummings immortalized this place in the 1925 verse, "i was sitting in mcsorley's." A table of books at the Strand. So, that’s it…the Cliff’s Notes version of my trip. If you want to hear more, ask me about it!